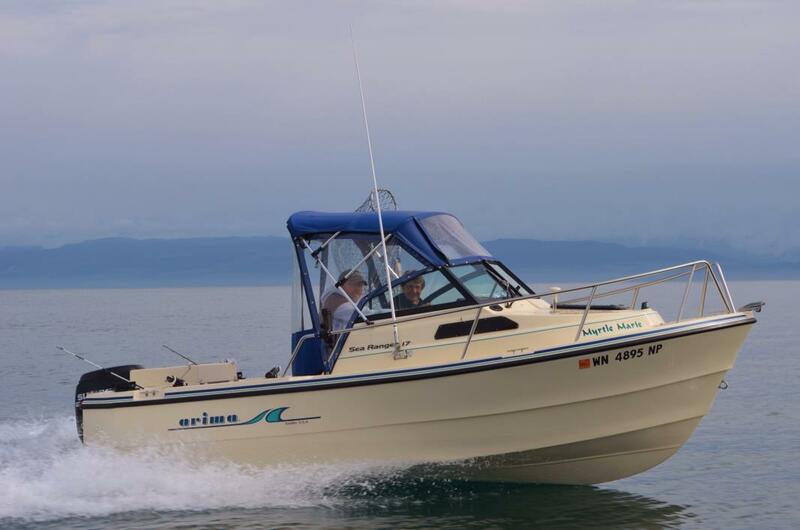 1991 Arima Sea Ranger 17 Everything as far as boat, motors and trailer to our knowledge are all year 1991. Both motors run strong. The 115 HP V-4 Johnson main motor shows 543 metered hours, has exactly 110 pounds compression on all four cylinders and the same is true with the Johnson 9.9 kicker motor to at 110 pounds compression on both cylinders although not sure on the running time hours on it. The lower unit on the main motor was replaced with another used one due to the reverse gear starting to go out and when it was replaced we pressure tested it before hand (no leaks) as well as added new gear oil, drain plug seals, water pump impeller and impeller housing. The last two pictures show the newer lower unit and also some minor fiberglass and gel coat repair work done near the drain plug. The trailer is a galvanized Shore Lander with side guides and rollers. It has a Hummingbird fish finder and VHF Radio as well. 1988 Arima SEA RANGER, FOR SALE: 1988 17' ARIMA SEA RANGER. MERCURY 100ELPTO 2007 MERCURY 9.9EXLHPT EZ LOADER TRAILER HUMMINBIRD 778C FISHFINDER IN FLOOR FISH BOX 2 PEDESTAL SEATS CABIN SPARE TIRE. PLEASE CALL WITH ANY QUESTIONS. 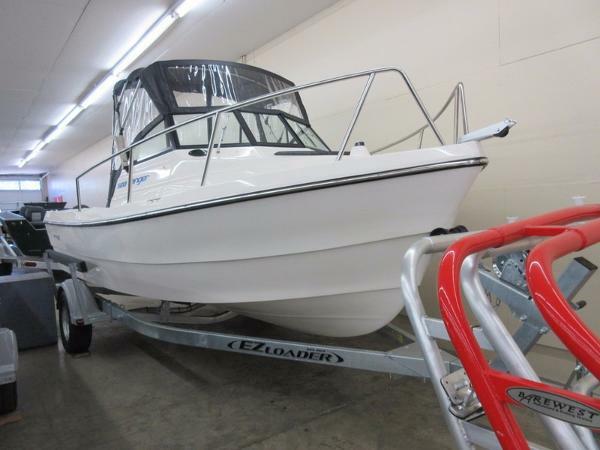 2016 Arima 19 Sea Ranger STOCK LIMITED 2016 Arima 19' Sea Ranger $355 / Mo. - 15% Down, 5.99%, 180 Months, O.A.C. 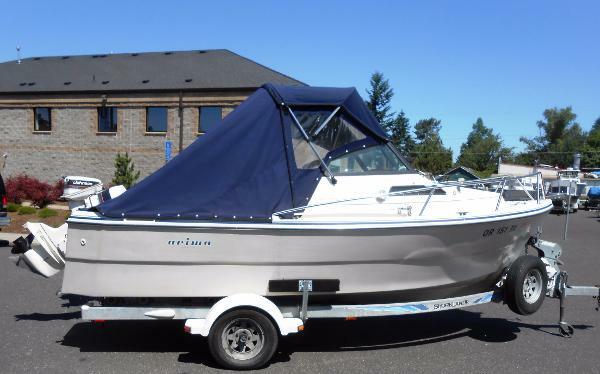 This 2016 Arima 19 Sea Ranger is a great fishing package for the Northwest. 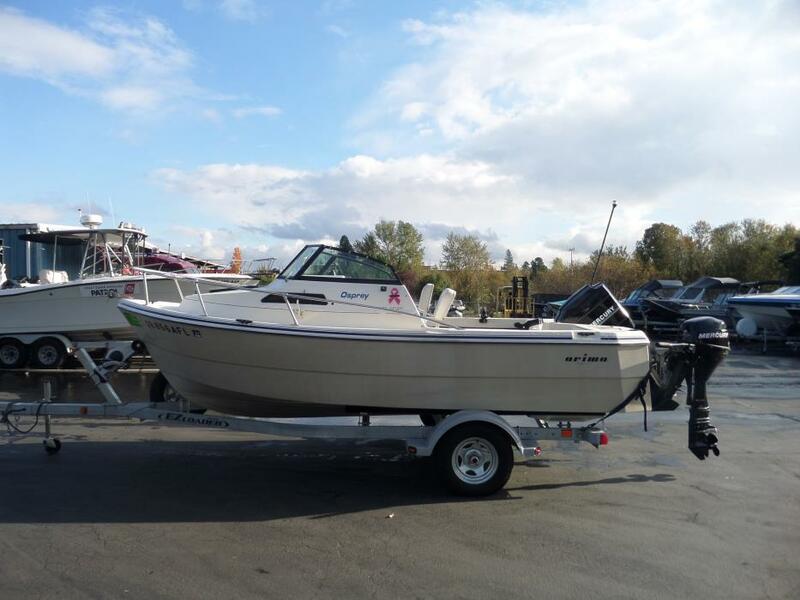 This great fiberglass fishing boat comes complete with an outboard table, Yamaha multifunction tach, v-berth cushions, portable head, bow anchor roller, canvas fishermans top, Baystar hydraulic steering, , rod storage grippers, 2 swivel seas, 2 jump seats, kicker motor bracket, 2 pole holders, fishbox and bat storage and more. This package is powered by a new Yamaha F115LB 4-stroke outboard engine and sits atop a galvanized E-Z Loader EZB 17-20 3100# trailer. This package is on sale now for only $49,536. Payments on this package are as low as $355 per month, OAC. Contact us today for a complete list of options, or make us an offer by clicking on the Make an Offer button on this listing!